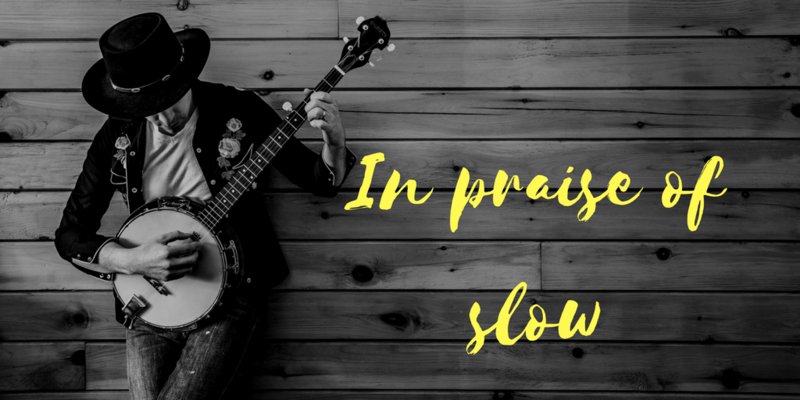 This blog argues the virtues of slowing down, and it tries to frame the argument as part of Christian discipleship. How to square the two? The Apostle Paul, for example, did not appear to slow down in later life, take it easy, pick up a hobby or two. A busy friend of mine grumbled that his (retired) wife wanted him to ‘go to garden centres in the afternoons’. He would rather be pressing on with work. Yet there is a Biblical metaphor for slowing down: it’s called ‘pruning’ and makes its appearance as those familiar with the Bible will know, in John chapter 15. It makes sense as slowing down. My apple tree is in full blossom at the moment. If the bees get busy, soon it will sprout loads of fruit, baby apples. Some will fall off of their own accord. But some I ought to take off. I remove some fruit to make the best fruit. I cut down its fruitful options to make it put its strength into just making good fruit. My tomatoes at the moment are hopeful little seedlings poking out of a flower pot. When they are bigger, I will pinch off the top so they stop growing. I will nip out some of their fruitful options. They won’t reach the sky. But they will make good tomatoes. I wrote to a friend the other day about the joys of the third age: house paid for, kids flown, perhaps free to choose your fruiful work for now–at least until or unless other circumstances overtake you. I think God kept pruning the Apostle Paul and slowing him down by throwing him in jail. This is best avoided. Cut down, slow down, fill your best fruit.